In the 1950s, the Fédération Internationale de I’Automobile (FIA) launched the Drivers’ Championship to find the world’s fastest driver in formula cars – the purest form of racing machine. That ethos was passed on to all FIA national member organizations. Top-level formula motor racing has been held in Japan in various forms since 1973, when Formula 2000 was launched. The competition was transformed into Formula Two in 1978 and then Formula 3000 in 1987. Japan Race Promotion Inc. (JRP) was established in 1995 and relaunched the competition as Formula Nippon the following season. Hiroshi Shirai, previously project leader on Honda’s Formula One race team, became JRP president in 2010. In 2013, the name of the competition was changed again to Japanese Championship SUPER FORMULA and a bold plan was implemented to upgrade the race cars and lift the profile of the competition with the clear aim of spreading the appeal of SUPER FORMULA from Japan to other parts of Asia and transforming it into a third great open-wheel racing competition after Formula One and Indy Car. (The competition’s name was changed to Japanese SUPER FORMULA Championship from the 2016 season). Akira Kurashita was named president of JRP in 2016. “Live” free-to-air satellite broadcasting of SUPER FORMULA races began on BS Fuji in 2017—helping to deliver the series to the homes of motorsports fans all over Japan. Another milestone was also achieved by the series in 2017 when “live” streaming of SUPER FORMULA races in English began on motorsport.tv for global subscribers outside of Japan to enjoy. In the early days, formula racing in Japan was led by top drivers such as Kunimitsu Takahashi, Kazuyoshi Hoshino and Satoru Nakajima, who later competed on the global stage in Formula One. In the Formula 3000 era, Michael Schumacher and Heinz-Harald Frentzen competed in Japan, as did Ralf Schumacher, Pedro de la Rosa, Eddie Irvine and Toranosuke Takagi in the mid 1990s, all tenacious drivers aiming to make it into Formula One. More recently, drivers such as FIA World Endurance Champion Andre Lotterer, Benoit Treluyer, Loic Duval and Kazuki Nakajima have been winners of the Japanese Championship. In 2015, Kamui Kobayashi, who competed in Formula One until the previous season, made a triumphant return to Japanese circuits, mesmerizing spectators with his driving skills. Stoffel Vandoorne, who was GP2 2015 Champion competed in the 2016 SUPER FORMULA series. He was followed by GP2 2016 Champion Pierre Gasly, who competed in the 2017 series. Interest from drivers like Vandoorne and Gasly, who have both since went on to compete full-time in Formula One, shows how SUPER FORMULA is increasingly seen as an important competition by the world’s top drivers. The SUPER FORMULA race car chassis is the Dallara SF14. Toyota and Honda supply 2.0-liter turbo-charged inline-4 direct injection engines and are introducing technical innovations to deliver ongoing improvements in fuel efficiency and power output. From the 2016 season, Yokohama Rubber became the competition’s sole official tire supplier, marking its return to top level formula racing after a hiatus of around 20 years. The company supplies its ADVAN racing tires, which are not only safe and highly competitive, they have developed 2 specs of tries which will be used in the 2018 season to add to the overall entertainment appeal of the SUPER FORMULA series. Excluding the engines, SUPER FORMULA racing cars are essentially single-manufacturer machines, meaning qualifying races are fought over extremely tight margins of less than one second. The outcome of each race comes down to pure competition between drivers and a battle of wits between engineers working to get the most out of the cars. 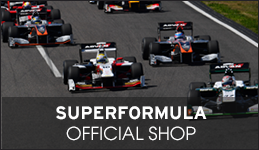 SUPER FORMULA races are run on world championship tracks such as Suzuka Circuit, Fuji Speedway and Twin Ring Motegi. Races are also held on old-style circuits such as Sportsland Sugo, Okayama International and Autopolis, where even the smallest errors are punished, making them popular among overseas drivers due to the narrow margins involved. The diverse nature of circuits during the season leads to even more competitive racing. 2018 will mark the end of the use of the SF14 chassis. The new chassis, the SF19, will be also be based on the same “quick and light” concept as the SF14, but with emphasis on even higher safety standards. Supplier Yokohama Rubber Co., Ltd.